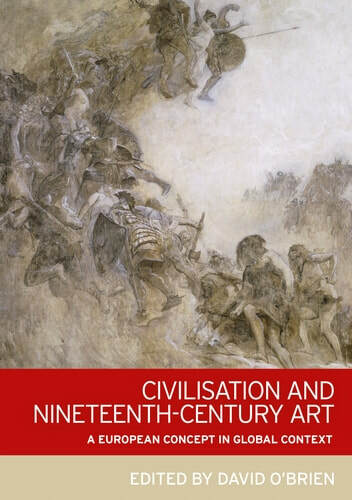 David O’Brien’s anthology Civilisation and Nineteenth-Century Art: A European Concept in Global Context looks critically at the origins of a concept that has been deeply embedded in the academic discipline of art history since its inception in the nineteenth century: civilisation. Alongside polarities such as self and other, orient and occident, primitive and modern, masculine and feminine, civilisation emerged in the Western imagination as the antithesis of barbarism. In the traditional Western canon of art, aesthetic objects divorced from any functional or ritual use were viewed as the ultimate product of civilisation, although many European objects that contradict this classification, such as the utility-focused art production of the Arts and Crafts movement, were still included in the canon and valued as evidence of cultural refinement. O’Brien’s intelligent and insightful introduction sets the stage for a series of essays that either directly or indirectly reflect on the blemished origins of art history from within this notion of civilisation. He offers an overview of the etymology of the term itself, which emerged in the 1750s with subtly different meanings in the French, British, and German contexts, and he outlines the various ideals of civilisation propagated during the eighteenth and nineteenth centuries, describing their alignment with then-popular ideas of race, religion, gender, nation, and empire. O’Brien also draws attention to different models of civilisation, which don’t all follow the familiar linear narrative of developmental stages of technological and cultural progress. The cyclical paradigm of civilisation proposed a rhythm of birth, rise, and decline, and O’Brien mentions Thomas Cole’s The Course of Empire (1833–36) as a prototypical illustration of this model, which warns of the inevitable fall of empires: prosperity leads to excess and, as domestic consumption and imperial ambitions outpace available resources, they eventually collapse. The volume’s essays explore art’s entanglement with early constructions of civilisation from various methodological perspectives. The most straightforward accounts examine works of art that take civilisation as their literal or allegorical subject. Daniel Guernsey’s “Theism and the Civilising Process in James Barry’s Society of Arts Murals” and Laura Malosetti Costa’s “Civilisation as a Suffering Woman in Late Nineteenth-Century River Plate” follow this approach. The remainder of the contributions reflect in more abstract terms on how notions of civilisation manifested themselves in visual art and in the writing of its histories. As the subtitle of the book indicates, the reception of non-Western cultures and art objects, measured against a European standard of “progress,” is at the heart of many of the volume’s essays. Since Edward Said’s momentous Orientalism (1978), postcolonial scholars have repeatedly exposed a dynamic of primitive versus modern that underpins nineteenth-century relations between East and West. For art history, an ongoing point of reference is the late Linda Nochlin’s landmark essay on Jean-Léon Gérôme’s Snake Charmer, “The Imaginary Orient” (1983), in which she argues that European paintings of non-Western subjects express, sometimes in the subtlest ways and most mundane details, a power structure based on ideas of the civilised versus the barbaric. On a foundational level, all the volume’s contributions are in dialogue with this tradition. Perhaps most directly, Julie Codell’s “Going Native/Going British: Victorian Mimesis, Alterity, and Repetition” shows just how rigid the power relations between colonizer and colonized could be, despite efforts to construct and reconstruct identity through cross-cultural masquerade, especially by way of dress. Since the 1990s, scholars of Orientalism—notably John MacKenzie and Mary Roberts—and of the reception of non-Western art in Europe more broadly, have responded to Homi K. Bhabha’s work on cultural hybridity by exposing the ambivalence behind many representations of exotic “others,” thereby challenging the binaries established by colonial discourse. Most of the essays in this volume evolve out of such efforts to rethink the Orientalist paradigm, and thus seek to complicate the categories of civilised and barbaric. Greg M. Thomas’s “Evaluating Others: The Mirroring of Chinese Civilisation in Britain,” for example, shows through the example of China’s reception in Britain that cultures were not necessarily categorized as either civilised or barbaric during the nineteenth century, but often fell somewhere in between. In Thomas’s words, different peoples were viewed as possessing “different degrees and kinds of civilisation, mirroring Europe strongly in one dimension even while mirroring Europe only weakly or not at all in another” (50). Thomas aptly describes this approach as “comparative mirroring” (49). One of the reasons he points out for China’s ambiguous status as a culture to be emulated or reviled, depending on the demographic of English society in question, is that, at the time, Europeans recognized China as a strategic trading partner more than a potential colony. Thomas thus exposes the contradictions inherent in the notion of civilisation, which still characterize relations with many developing countries today. Western economic interests lead to tolerance of certain oppressive regimes, whereas others, often guilty of less-severe human rights violations, become targets of military intervention and occupation. Emily Eastgate Brink’s essay “Civilisation and the Encyclopaedic Impulse: Hokusai, Diderot, and the Japanese Album as Encyclopédie” offers a parallel account of Japan’s status in nineteenth-century France. She discusses Diderot’s Encyclopédie and Hokusai’s Manga as comparable compendiums of cultural knowledge, and reflects on the ambiguity of Japan’s position as a civilised nation for French audiences: Japan was viewed as unindustrialized and technologically backward, on the one hand, yet refined in its print culture and decorative arts, on the other. Maria Taroutina’s contribution “Second Rome or Seat of Savagery? The Case of Byzantium in Nineteenth-Century European Imaginaries” further complicates the East/West dichotomy. Taroutina looks at the reception of Byzantium in late nineteenth-century Europe, which fluctuated dramatically between the despotic and degenerate East of Orientalist discourse and an uncorrupted ancient civilisation and model of Christian virtue. Where Byzantium fell on the spectrum depended on the geopolitical agendas of European nations at any given moment. Taroutina sums up what most of the essays in the volume suggest about the concept of civilisation in the nineteenth century—that “the discursive construction of the civilised versus the primitive did not simply exist as a fixed and stable, binary opposition. Instead, it was in a state of constant flux and evolution, in accordance with the demands, exigencies, and needs of particular political and cultural contexts” (174). The instability of the idea of civilisation was also mobilized to establish hierarchies of economic, industrial, and cultural superiority within Europe itself. This is explored in Melissa Dabakis’s essay “Civilising Rome: Anglo-American Artists and the Colonial Encounter.” Dabakis reveals how Anglo-American artists used negative Orientalist stereotypes about Eastern subjects, such as exoticism, sensuality, femininity, and irrational behaviour, to characterize modern Italians and define themselves in opposition to an “other” that was viewed as more accessible, due to its proximity to their own culture, than fantasies of the Far East. Dabakis’s case study is also fascinating in that the Anglophone artists in question were mainly women, who were themselves subject to the same negative associations as the Orientalized Italians they represented. As Dabakis explains, “The privileges of their American nationality and the advantages of their Anglo-Saxon race trumped the limitations of their gender in the colonized territories of pre-unification Italy” (105). Situated in the middle of the volume is Jeanne-Marie Musto’s eye-opening and compelling “Kultur and Zivilisation in 1842–43, or the Failure of the First Global Art History,” which really frames all the other essays. Musto examines the first effort to construct a global art history, Franz Kugler’s Handbuch der Kunstgeschichte (1842). Kugler’s endeavour seems strikingly related to recent revisionary initiatives in the field, particularly the international scope of new or revised survey texts and the creation of faculty lines in the history of non-Western art at universities across Europe and North America. Although Kugler clearly articulated his global ambitions for the project, his survey does not give equal weight to the art of all cultures. The non-European component of the work represents only a small fraction of the content, and its assessment is closely aligned with hierarchical ideas about race put forward in the then-emerging disciplines of geography and ethnography. Kugler understood European art as evidence of refinement and civilisation, whereas he deemed the art of non-Western cultures to be at an earlier stage in a linear development toward civilisation. Some cultures fared worse than others in his model. Whereas Byzantine and Islamic art are valued for approaching European sophistication, African art is barely discussed. As Musto explains, “For the purposes of the Handbuch, Africa did not exist. It provided the unnamed exception to the universality of art, and a void in the human progress that art embodied and indexed” (118). Kugler’s global art history may have been ahead of its time, in spite of its biases, but its international scope did not lead to its widespread use in the academy. It was overshadowed by a brazenly Eurocentric survey by Karl Schnaase, Geschichte der bildenden Künste (1843). Musto’s article illustrates how the inception of art history as an academic discipline, together with the material chosen for inclusion, was dependent on nineteenth-century constructions of civilisation, replete with their cultural hierarchies and other prejudices. Undoing and rewriting this disciplinary trajectory remains an ongoing and complicated process. Civilisation and Nineteenth-Century Art contributes to the ever-expanding body of scholarship published since the 1990s that interrogates the relationship between imperialism and artistic production in the West and its former colonies. The volume complements Manchester University Press’s series Studies in Imperialism, which has published a number of important, related books over the last decade. Particularly worth mentioning in this context is Tim Barringer, Douglas Fordham, and Geoff Quilley’s 2007 volume Art and the British Empire, which was motivated by the premise that “the concept of empire belongs at the centre, rather than in the margins, of the history of British art” (3); it informed important exhibition projects, such as Tate Britain’s Artist and Empire: Facing Britain’s Imperial Past (2015­–2016) and the reinstallation of the permanent collection of the Yale Center for British Art, themed Britain in the World (2016). The essays in Civilisation and Nineteenth-Century Art follow Barringer, Fordham, and Quilley’s guiding principle, but within the limits of a more focused topic, and with a broader geographical scope. Through subjects that cut across race, gender, geography, and historical timeframes, this collection of essays offers a wide-ranging and nuanced perspective into the conceptual complexity and malleability of the notion of civilisation in nineteenth-century art. Nina Amstutz is Assistant Professor in the History of Art and Architecture at the University of Oregon.